This is a blog about hiking in general and the John Muir Trail in particular, but occasionally I drift off topic. Last year I told you about what I called the World’s Greatest Workout. I’ve also recommended five restaurants one can find between Happy Isle and Lone Pine. This entry is even further afield. I should begin by telling you a little about myself: I’m about as non-new-age as you can get. I don’t believe in the “Age of Aquarius,” despite being born an Aquarian. I think almost all alternative medicine is bunk. I do not eat organic food (does that mean what I eat is “inorganic”?). I’m about what you would predict for a guy who was born in 1955, raised in the Midwest, and spent thirty years in the Army. That said, for the past month or so, I have started meditating. Yep…eyes closed, steady breathing, the whole enchilada. 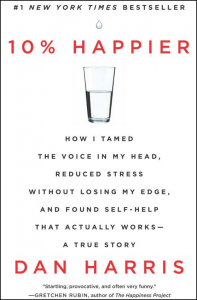 I do this because of a little book called “10% Happier: How I Tamed the Voice in My Head, Reduced Stress Without Losing My Edge, and Found Self-Help That Actually Works – A True Story” by Dan Harris. Mr. Harris is a hotshot reporter for ABC news. In 2004 he had a panic attack, on the air, in front of several million people. That set him off in search for some answers. In the decade that followed he found, explored, and in most cases rejected one charlatan after another in search of a way to prevent it from happening again. After sifting through more manure that any one man should rightly endure, he actually found a pony: mindfulness. He makes a pretty compelling case for it in the book. Speaking of the book, it’s terrific. 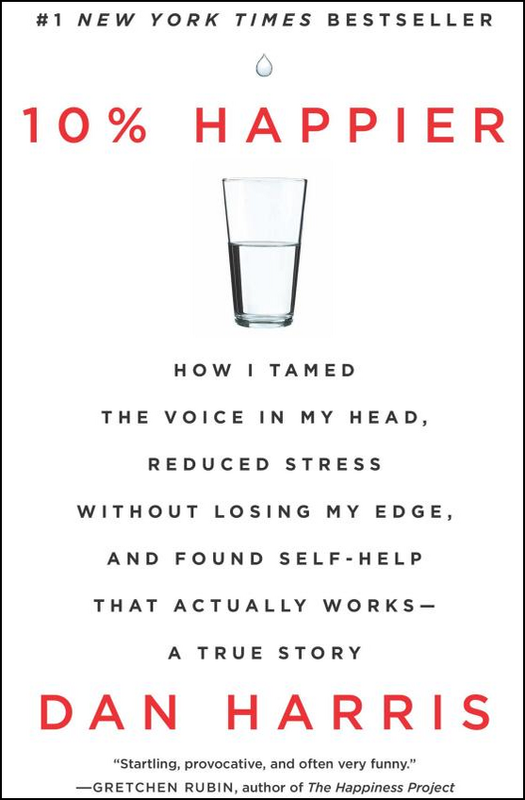 It’s really only about one-third a “self-help” book; the remainder is a memoir that is eminently readable. I was fascinated by his stories as he sought answers from people every instinct told him were fools and scoundrels. In fact, that’s the other self-help lesson from the book: in most cases, trust your instincts. I started practicing “mindfulness” the day after I finished the book in May. I’ve missed only three days since, and on those days I really missed my period of meditation. I’m up to fifteen minutes, which seems about right for me. How does it help? As the title implies, it just makes things a little better. When speaking in front of a crowd (I’m often called upon to brief groups of people) I find myself hunting for the right word far less often. During our recent vacation to Tokyo I also noticed that I was doing a lot more of enjoying what was around me, and a lot less of planning what I was going to do next. Which brings me back to the John Muir Trail. One of the techniques Mr. Harris discusses is “walking” meditation. In “Planning Your Thru-Hike of the John Muir Trial” I mention how the best part of the hike comes between Donahue Pass and Glen Pass because, between those two points, you are neither starting nor finishing, you are just hiking. In a way, it’s about 150 miles of nothing but meditation. No wonder I always feel so great afterwards! Fantastic post….and this is not a “new age” concept at all (I shy away from that too). There have been numerous medical studies which indicate “mindfulness” (or as I call it, just being still) not only has emotional benefits, but physical ones as well. Evidently, like our bodies need rest after exertion, our brains do too. Compared to traditional psychiatric and medicine based treatments (with limited results) available for PTSD, mindfulness has an astronomical success rate. I always wondered why I enjoy backpacking alone so much, and never really understood until I started practicing mindfulness. The simplicity, quiet, and just being “unplugged” is what makes me happy. Thanks for the comment and the kind words, Kathy. Wonderful post – and very appropriate. You might enjoy reading books by Jon Kabat-Zinn, about mindfulness meditation and mindfulness based stress reduction. Although I don’t meditate daily, I find it so helpful at various times (waiting in line, sitting on a plane, or trying to get back to sleep at night). I have become much more aware of my surroundings and enjoy the peak times – like our JMT hike or just going for a run out my door – without headphones! As Kabat-Zinn notes, we are often either rehearsing for the future or rehashing the past rather than being in the moment and actually living our lives. Thanks for the comment and the recommendation, Carol! It has been known for years that even a short stroll in the park can relax you, & help you work through your problems, Great physical, & mental health rewards. A longer walk like backpacking is ideal! When I was backpacking the TYT in 2002 is when I noticed the rewards, & then again in 2006 when I backpacked through Glacier into Waterton International Peace Park. Just walking & seeing Nature in full bloom not in a website or book calms you, & you can actually think things out since you do not have all the distractions! Great point, Cole. Thanks for the comment! You might also enjoy “How to Walk” by Thich Nhat Hanh as another approach to walking meditation and mindfulness. The whole book takes about as long to read as two meditation sessions. Thanks, Bob. Sounds like it was written for someone with my attention span! I have to echo the recommendation for books by Jon Kabat-Zinn. He and his wife wrote one on parenting, which was the most useful parenting book ever – far better than the “how to” ones. I need to get back to meditation…been away from it for a few years for a variety of reasons. I think if something went wrong in the back country this could be a very helpful technique to prevent panic and help you think more clearly and carefully about the choices available, perhaps leading to a better outcome. Great point, Karen. There are lots of circumstances where calming yourself down is a good idea. Thanks for the comment!